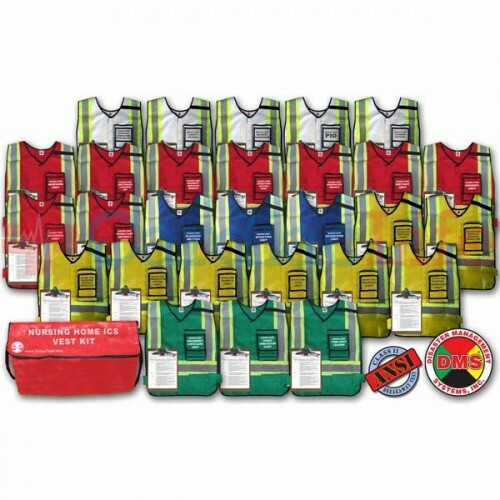 The DMS-05850 Nursing Home ICS - NHICS Command Vest Kit is the result of collaboration between the Florida Health Care Association and the California Association of Health Facilities. The Incident Command System is part of the emergency management system in many levels (federal, state, and local). It is the basis for the National Incident Management System and California's State Emergency Management System. Every significant incident or event, whether large or small, and whether it is even defined as an emergency, requires certain management functions to be performed. Seeing the need for a method of organizing and coordination of emergency efforts in the long-term care community, the California Association of Health Facilities developed the NHICS (Nursing Home Incident Command System) Manual and Train-the-Trainer Program based upon work done by the Florida Health Care Association (FHCA). 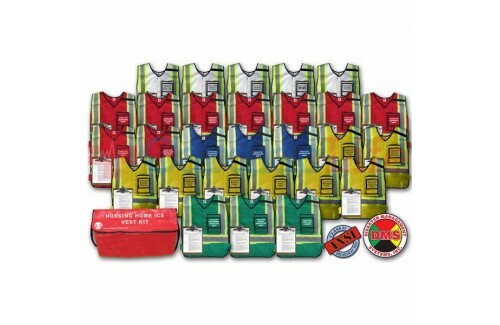 The DMS-05850 kit incorporates NHICS job action sheets into a scalable response tool designed for nursing homes. NOTE: In 2011 the NHICS was revised by the American Health Care Association Disaster Preparedness Committee to increase its national applicability and relevancy to long-term health facilities. Users are encouraged to check NHICS site for updates and revisions.